The seedlings are very close to each other. How old are the plants when you move them to different pots? And how many plants do you have in one pot (e.g. diameter 11cm)? 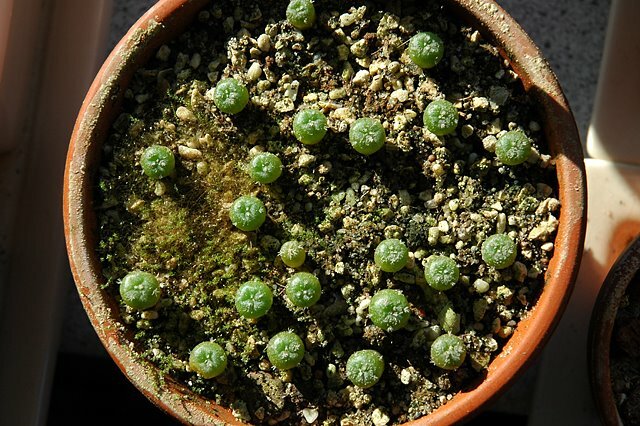 Usually I’m sowing 30 seeds per pot (I’m using 11cm ~ 4'' pots) which amounts to 15-25 – in exceptional cases 30 – plants. I’m leaving the seedlings in the pot for at least a year, generally longer. They are repotted when they start to get crammed. Why limestone gravel? All cacti require slightly acidic soil; when exposed to water the gravel will make the soil highly alkaline. I'm trying to emulate the plants natural growing conditions, but they might actually thrive in acidic soil. It would be an interesting experiment to compare plants growing in calcareous/acidic soil but otherwise having similar conditions. Another note on limestone gravel - I found the information quoted below at the Living Rocks site. Horticultural or hydrated lime - calcium hydroxide - must NOT be used in any circumstances as this does have a strongly alkaline reaction and will damage the roots of plants." I was wondering if anyone can tell me why my seedling are growing tall and skinny. Only some are though. Around half are normal looking. Usually etiolation is caused by too low light levels - are the elongated seedlings growing under the exact same conditions as the normal ones? Yes they are all grown in the exact same conditions. I have brought them inside for winter and it seems more are begining to do this. Is this going to make them grow funny after I put them in the summer sun? Are you cutting back on water to bring the plants into dormancy? If the plants keep growing during the low winter light levels they'll definitely grow leggy (unless you use artificial light). It's hard to say if the plants will retain their etiolated growth habit, but young seedlings should be able to revert to a more normal form when growing older. 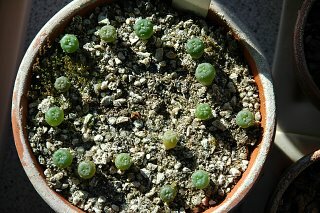 I used to be able to get "Lophophora williamsii" seeds froma mail ordercatalog and can't find them any more.. can you help? The retailers I've done business with are listed on the seed and plant retailers page. In two weeks I would expect a large fraction of the seeds to germinate. I'm germinating my seeds at a temperature of about 25 C (~77 F) and at 100% humidity. The seeds are sown directly on top of the soil and lightly pressed into it, I'm not covering the seeds apart from that. While germinating the seeds are exposed to light, but no direct sunlight. 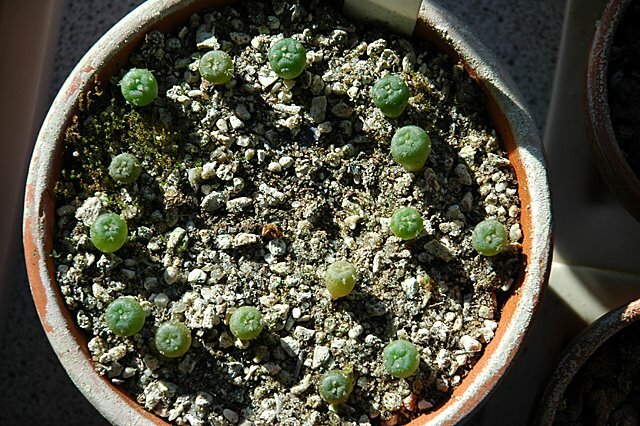 Usually Lophophora seeds are easy to germinate and have very generous germination rates - could your seeds be too old or not fertilized properly? Anyway, I would leave the seeds and see if anything germinates in the coming weeks. Hi, about 4 weeks ago I planted some L diffusa seeds for the first time in bags on a heat tray near a window. I sneaked a look recently and most seeds appeared not to have germinated. I found 1 tiny green ball but am unsure if it's a cactus or just some green bit of cactus mix as it is very dark green. Could this be a cactus and are the other seeds likely to germinate? In my experience a large fraction (40-90%) of the seeds will usually germinate in 2-3 weeks, with a few runner-ups in the following weeks. That being said, I would leave the seeds for some month to see if more germinate. If your small green ball is a cactus, it should swell noticeably in the weeks to come; alternatively you can use a loupe to check it right away. Is the moss a danger to the health of the youngsters? I am having a similar experience in my high humidity environment. As long as the moss doesn't outgrow and cover the seedlings I haven't experienced any ill effects. If the moss threatens to take over the pot, just remove it from the bag and the drier environment quickly kills it off.